Let me show you mixed salad / acar from Kuala Terengganu, best eaten with local keropok. 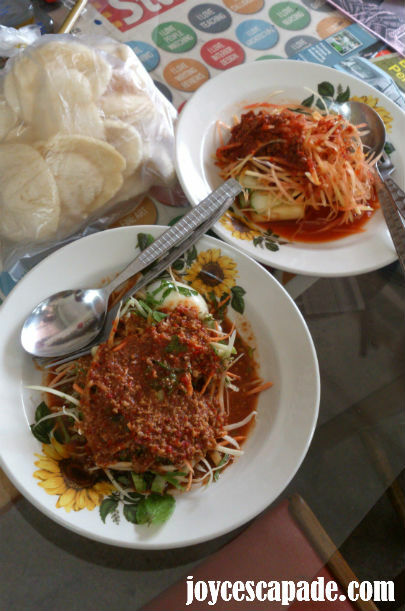 The top one is a salad made from grated papayas, cucumbers and pineapples cubes, and drenched in a kind of tangy sauce made from chopped chilies. According to my hubby's grandfather, the bottom one is called che nui, literally translated as 'green egg'. I'm not sure why is it called so. Che nui is made from mixed grated cucumbers, carrots, basil leaves, mint leaves, half of a hard-boiled egg, and drenched in tangy peanut-y sauce. Salad looks yummy but I will omit the papaya. Can't eat papaya. Oh. Why can't papaya ahh? Just curious.